I would like to acknowledge that the Saskatoon Police Service is on Treaty 6 Territory and the Homeland of the Mètis. Our service is a great place to build a career. We are proud to have achieved the title of Saskatchewan’s Top Employer for the sixth consecutive year. With over 600 sworn and civilian members, the SPS is a progressive work place with a strong emphasis on the physical and mental well-being of its members. There are endless opportunities as a member of the SPS; from Dispatch to Detention, Walking the Beat to the Tactical Support Unit - our service boasts 54 different areas of Policing to best serve our community. Saskatoon Police celebrate diversity - both within our service and in the community. Being reflective of the people and organizations of Saskatoon is vital to maintaining the support and trust of those we serve. We can’t do it alone. We recognize the importance of our partners in making Saskatoon a safe place to live, work and visit. Maintaining those long-standing relationships and building new ones is key to the success of tackling root-causes affecting community well-being. We pride ourselves on professionalism which includes ongoing training, strong accountability measures and the highest standards. 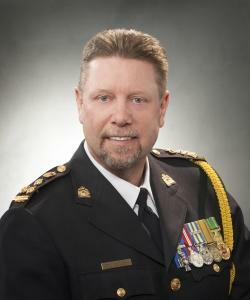 As Saskatoon’s Chief of Police, I am honoured to serve this growing city and extremely grateful for your support.